A range of material handling equipment, ergonomically designed to eliminate operators fatigue and manufactured by Bel-Tyne. 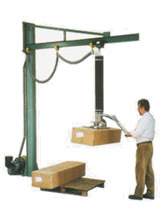 The Bel-Tyne Vacuum Lift unit is a manually operated lifting device which has been ergonomically designed to eliminate operators fatigue and possible injuries relative to the handling of heavy or irregular loads. The Vacuum Lift units are manually operated using a suction head with flexible lifting tube. A single twist grip hand control allows the head to be positioned easily on the unit load, the suction is applied and allows the loads to be lifted and maneuvered either upwards, downwards, sideways or rotated through 360° for exact positioning requirements. The rate of descent and ascent of the unit is simply regulated by the twist grip. Disconnection from the unit load is done quickly and easily. The unit is simple and safe to operate. If power is lost, the load will slowly lower to the floor. 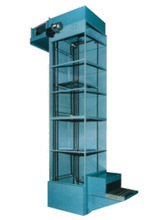 The unit can be suspended from overhead hoist, beams or mobile. Various type suction heads cater for different loads. An automatic de-palletiser is available. The Bel-Tyne Escaveyor is a fully automatic system, designed for lifting or lowering unit loads, combining a vertical escaveyor with associated infeed and outfeed discharge conveyors. The Escaveyor/ Lowerator is designed to convey and elevate a wide range of products, such as boxes, cartons, bags, drums, pallets or heavy components. The fully automatic system incorporates powered roller bed infeed and outfeed conveyors, interlocking with the vertical Escaveyor/ Lowerator consisting of a varying number of flexible platforms, depending on height, which are allowed to flex in one direction and automatically form a firm support platform in the other, being suspended at each corner from four heavy duty carrier chains. An automatic control module provides the facilities for varying the feed rate and the indexing of the loads between the horizontal and vertical transfer modes. 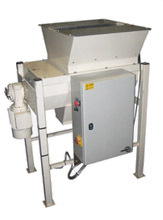 The range of Bulk Waste Shredders allow bulk waste to be reduced by up to 80%. All types of waste can be handled from cardboard to steel drums, plastic to paper, to steel. Units can be complemented with infeed and outfeed ancillary equipment to suit all installations. The Bel-Tyne Minor Compactor has been developed to compress many types of waste materials, including bags, paper, cardboard, plastic or paper sacks. 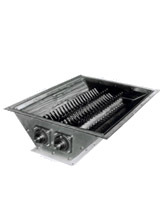 Waste material is dropped through the infeed chute into a specially designed reducing unit. As the reducer rotates, material is forced into the outlet compaction tube. The compacted material extrudes out of the tube and into a plastic receiving bag, which is fitted over the outlet tube and held by a rubber retention ring. 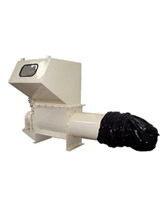 The compacted waste bag can then be handled with minimum dust emission. The 'Minor' compactor can be connected to a dust extractor to provide a system in which dust emission during compaction and subsequent handling is minimized. The Bel-Tyne Automatic Lump Breaking Unit is an ideal solution for breaking up material. materials such as powder to fibrous blocks. Paddle type - This is designed for friable lighter materials which do not require as much power to break up. Both units can be manufactured in mild steel or food quality stainless steel.